This is the 56th volume of Bookmarked Recipes - Every Tuesday Event. You can find recipes for all other volumes here, where we all with link the blog posts where we posted a recipe that we had Bookmarked from another blog or book or magazine or simply from a TV show written on a blank paper. It would be great to know when you bookmarked it (date), if you would like to share it, not mandatory. You will have to prepare a recipe that you bookmarked previously from a blog, or any recipe source, it can even be from a book or magazine which you had cut, or taken notes from or folded the paper of, to remind you to make it sometime. In short, any kind of bookmarked recipe is allowed. No disrespect or offense to anyone, but recipes from some relatives will NOT BE allowed, as they don’t fall into the criteria of bookmarking. For every recipe you make, please post the recipe source (a link if it is a website or picture of the book/magazine, if it is from the print media) along with picture (s). You are NOT ALLOWED to copy/paste the recipe and just link it to the original blog or website. If you took it from a magazine, we will appreciate a scanned picture of the recipe mentioning the book name specifically than you copy pasting the recipe. We have seen quite a few of copyright issues in last few months in blog world, and this is keeping that in mind. If you tweaked the recipe in any way to suit your needs, please ONLY mention the tweaks. This is a pure vegetarian blog, so, I will only allow vegetarian bookmarked recipes here (eggs are allowed ONLY in baking). Your dish can be from any course, no restrictions on that. You can link more than one bookmarked recipe (with picture). We will add a "Mr. Linky" to every Tuesday's post, so that you can link your post directly to my post and that way everyone can see those recipes right away and do not have to wait for my roundup. No need to send me an email with your posts. If you are a non-blogger, please feel free to send me an email @ priya.mitharwal@gmail.com with your recipe and a picture and of course the recipe source. Please link your posts which have tried bookmarked recipes with the following logo. This is mandatory. Once you have posted your recipe on your blog, simply link it using "Mr. Linky" below. Linking will open only after 12 am on 30th August 2011 (India Time) and will stay open till end of the day (US Pacific Time). 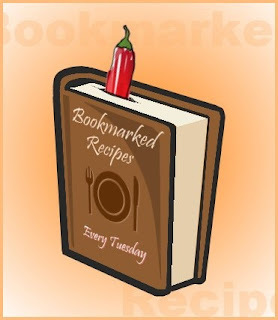 Hoping to see lots of recipes as we know all of us have bookmarked recipe, blogger or non-blogger. If you are a non-blogger, please feel free to send us the recipe with pic and the source of your bookmark. You can link your recipe either from my blog or Aipi’s blog.